Perfectly round off your business card design from as little as £15.68. 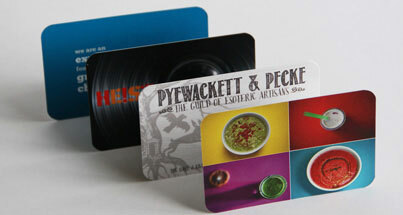 Rounded corners make your card engaging, professional and are a great alternative to standard square edges. The round circular edge makes your business card compelling and outlines the innovation of your company which is always attractive to potential customers. Get creative and fully utilise our die-cutting capabilities to create truly unique cards. Matt 340gsm, Gloss 350gsm, Recycled 340gsm and more.. Items are generally printed and delivered in 5 to 7 working days. Let our designers create your artwork for you. Round corner prices exclude VAT at 20.0% (where applicable). Prices are in British Pounds (GBP). "Adding rounded edges to our business card was a cost effective way of making a better impression to potential customers. We are glad to say Cards Made Easy have always met our quality expectations." How are circular corners added to your business card? We first print your business cards using conventional methods depending on which material (matt, gloss or laminated on recycled or Conqueror paper). They are then trimmed to your specified size which doesn't necessarily have to be the standard business card size either. 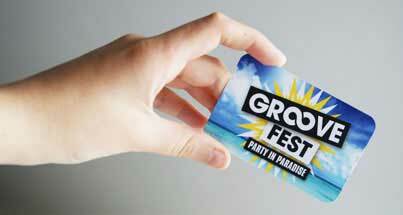 Using a special punch the edge of your cards are then cut into a smooth rounded shape. Get creative use bespoke die-cut shapes. Don't go round and round in circles looking for ways to market yourself better, give your business an edge by using a card that isn't the bog standard rectangle shape. Utilise our comprehensive die-cutting services and create compelling business card shapes that range from simple curved corners to complicated vectors. 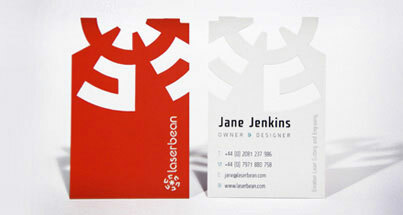 Stand out with interesting business card shapes. You have been working on that sales pitch around the clock, all of the hard work is done and you are ready to introduce yourself to the client. It's important you present a card that will not allow them to easily forget your business, after all the very purpose of your business card is to act as a memory aid and what better way to achieve this than with a card that is an interesting shape. The possibilities are limitless here and we offer a FREE design support service to discuss your requirements. Whether you're looking for curved edges on your business cards or have a creative idea on a shape you would like cut out from your cards we can discuss and show you what it will look like. When it comes to really special business cards like these quality management is imperative. That's why we have a strict quality assurance process each of your cards will pass through before they're delivered to you. This means that you can have the confidence to know that whatever design you choose, whether die-cut or rounded corners, you get the business cards you ordered. Please note that we don't offer die cut business cards as an online product. The reason for this is that we need to discuss your design requirements fully, and provide you with a quote that fits your needs. Call us on 0207 566 5090 to discuss your die cut business card ideas, or alternatively please provide a brief description of your requirement through our Quote form here.